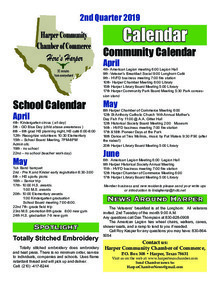 Harper Happenings, local news/items of interest. New members recently joining our chamber of commerce, supporting our community. Download "Harper Chamber Newsletter - 2nd qtr 2019.pdf"
Download "PHP Meeting February 19, 2019.pdf"
Get your raffle tickets from most church members, or some local businesses. They are available NOW! Meal is by donation. Sit and enjoy it with fellowship, prize drawings, auction, & activities, or get plates to-go at the convenient drive-thru.